Worship at Wonford is a joy and a challenge, whether more creative in style or traditional. People of all ages and backgrounds make for a stimulating congregation. Our Bible Study groups encourage knowledge. Our various prayer groups and events sharpen our focus. Emmaus and Discipleship courses strengthen faith. The Roundabout Cafe, Men’s Morning and Friday Group offer hospitality to older people in the community, while Young Church, Friday Toddlers, Girls’ Brigade, Tuesday Children’s Clubs provide social and learning space for the young. 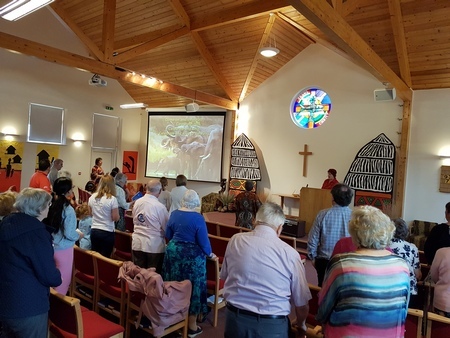 Our Sunday evening programme includes Prayer and Praise, Messy Church, Café Church, Film Services and Celebrate Together as well as our planned worship. We offer strong pastoral support to all and we seek to serve God in the community in any way he leads us. Our minister Reverend Bruce Sawyer joined us in September 2013. We pray for God’s wisdom and that the growth in our numbers and spirituality will continue. 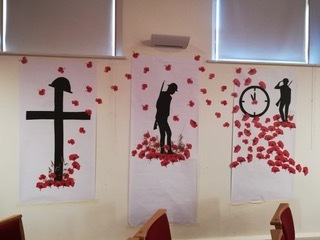 A wall of our church with posters for Remembrance Sunday. 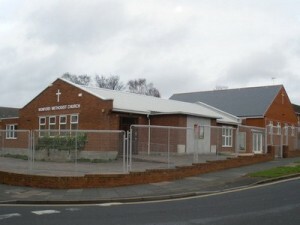 The fence around our church is a barrier, but also an opportunity. 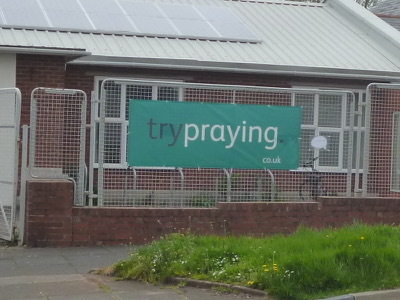 Instead of having a prayer station inside the church, we’ve used our fence, next to a bus-stop and opposite a LIDL’s store. 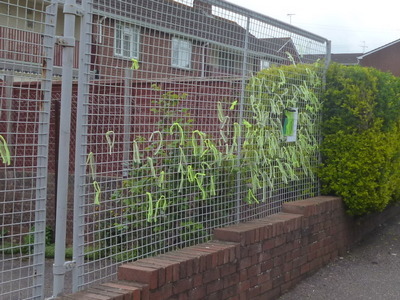 The ribbons are provided for passers-by to tie to the fence as a symbol of their prayer. Here’s a view of the interior of the worship area, taken when we celebrated Africa Sunday. It was a prayer filled service with folk sharing news of Zimbabwe, Uganda, Zambia and Malawi.